I write this curled up on the couch, sipping hot holiday spice tea (compliments of Santa), with the Christmas tree lighting the room. Gathering Blue by Lois Lowry is on the couch beside me, and the rest of my family is asleep. This Christmas was beautiful; while we officially began our celebration with Mass on Christmas Eve, we really began Christmas break a few days ago when both my brother and I returned from college and my dad took off work. A tornado of little children tore through our living room on a mission to create messes. The remainders of a long day are strewn every which way. Instrumental Christmas music is playing and there is the promise of a day of unwinding and cleaning before more family events. I hope that all of you have had beautiful Christmases, full of family and friends and crazy weird traditions! My Christmas gift, both to myself and from my parents, is a TORCH! That's right-- I now have a propane/oxygen little torch that can heat up to, you know, just a couple thousand degrees. I also now have a crockpot labeled "poison" (for heating up pickle, a substance which cleans metal when it is discolored from heat and flux). I can now solder!!!!! My little sister and I test-ran the torch, my metal stamping set, and my miniature hacksaw to create these Christmas gifts! 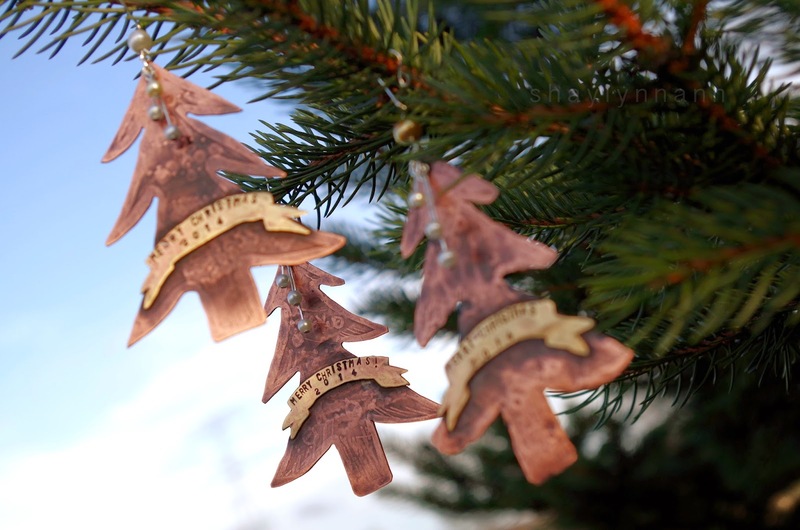 These Christmas tree ornaments are handmade from copper and brass. My eleven-year-old sister cut out the brass banners and stamped the numbers on them. (Can you believe it?!) She requested to be my apprentice over Christmas break, and while she sometimes makes things take forever, on the whole she's actually been very helpful and is becoming quite skilled. 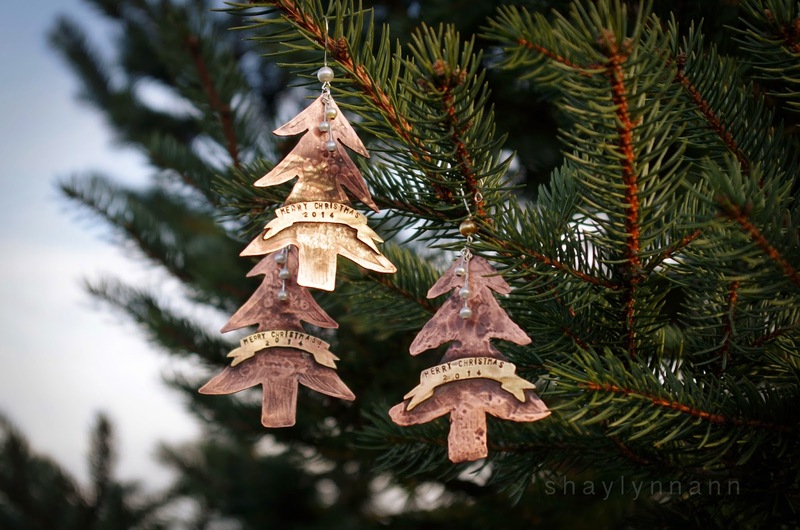 The trees are hand-cut from copper which I etched and then drilled. Normally I would etch copper with ferric chloride, but I recently ran out and discovered that buying more would be quite expensive. I was using etchant from my grandpa's old PCB etchant kit before. So, I did some research, and my dad and I mixed up an acid bath that is essentially a cupric chloride --> cuprous chloride etchant. So now I also have an apple juice container with bright yellow duct tape that shouts "DANGER: Poison" in thick Sharpie! 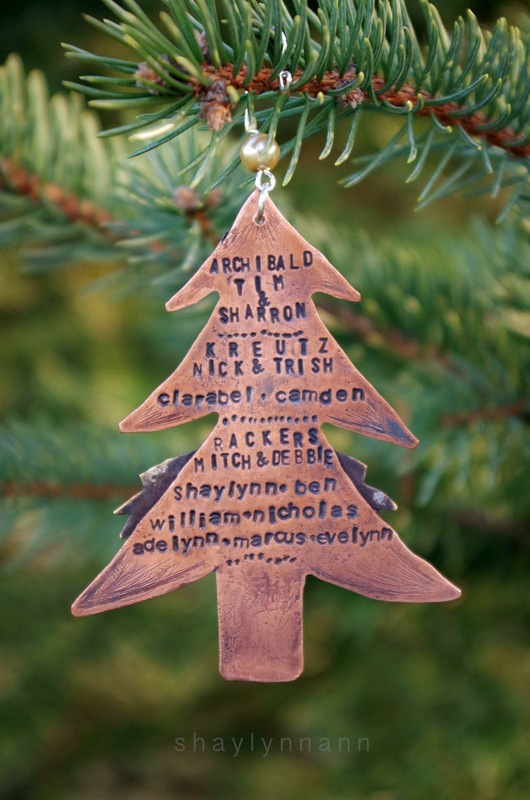 Unfortunately I had already etched quite a few pieces of copper by the time I got around to etching the trees and didn't properly reconstitute the solution, so the etch was not very deep. That or my resist came off. I'm not 100% sure what went wrong. 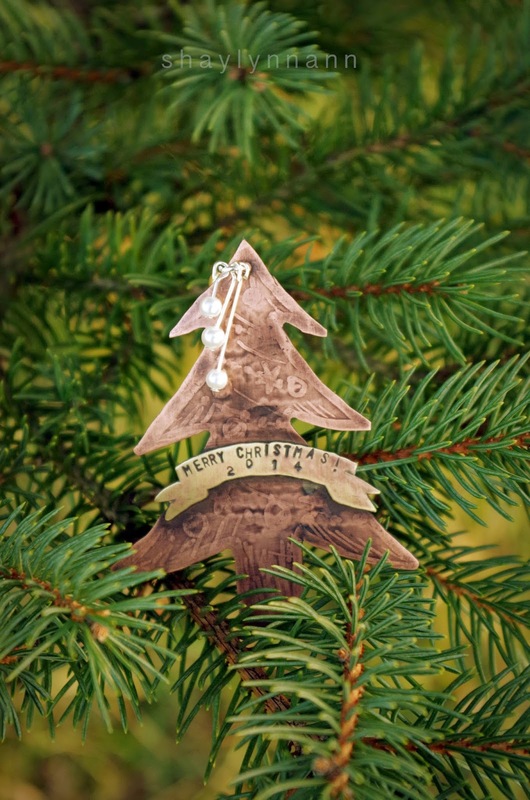 I think that the idea of little handdrawn ornaments comes through nonetheless. 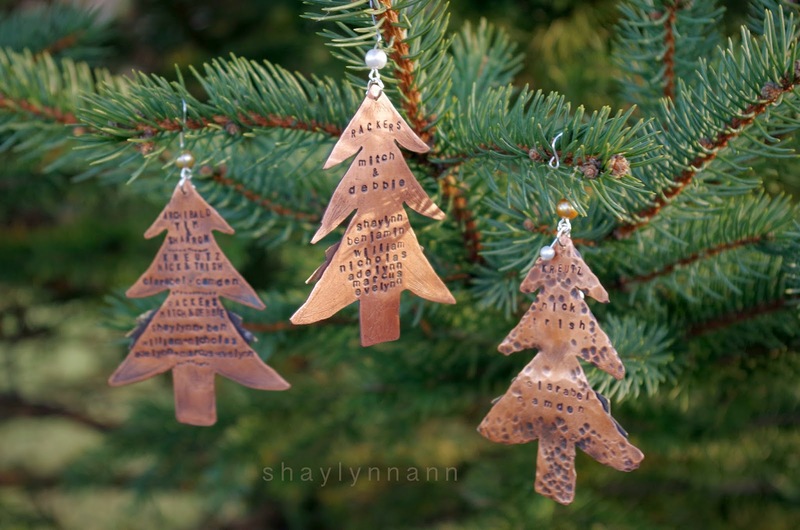 I then soldered the stamped brass banner onto the tree (THAT was a process because I had a difficult time getting the whole copper tree up to temperature). As you can see, my sister and I had a lot of stamping to do. Each letter is hammered in by hand. At the very end of the process, we submerged the ornaments in a Liver of Sulfur solution, sanded it down, and sealed the pieces with a spray expoy resin. Then, we strung glass pearls onto headpins, and made a pearled tree hook from an eye pin! My grandparents gifted me a dip pen for calligraphy (and for my upcoming illustration class) so I'll be experimenting with that, too! I've been using a worn-out fountain pen with three nibs since I was eleven or twelve. But that is not now. Now is time for bed, and visions of sugar plum fairies-- it's almost surreally peaceful tonight. 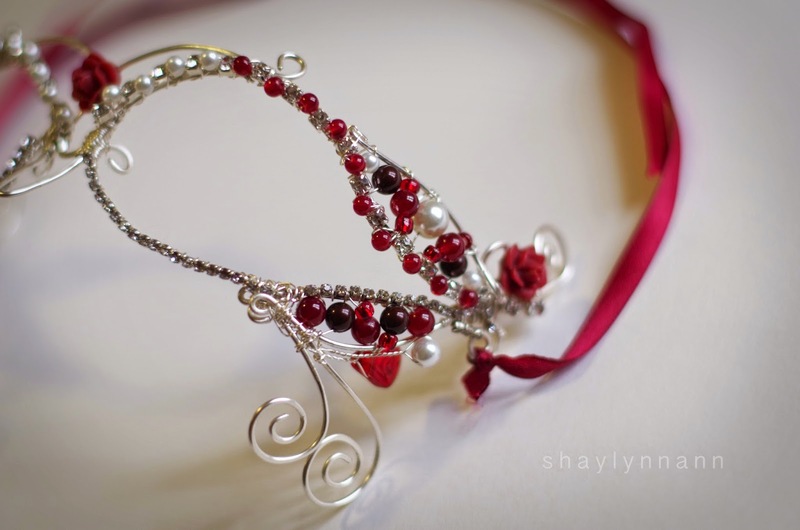 Over the past two years, I've had the honor of making jewelry for several weddings. 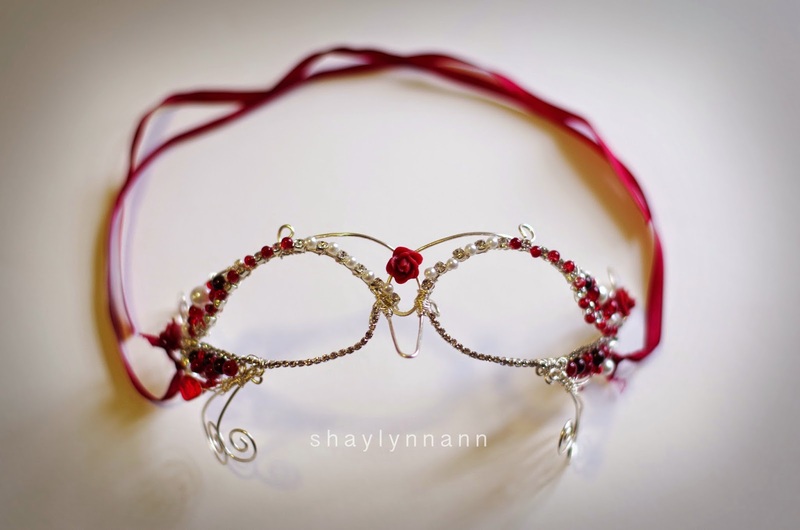 This autumn, a bride asked me to create an Entwife circlet for her. My side of the dorm room started to look like a fairy trove as it became laden with strands of wire, boxes of beads, and pinecones for two weeks. The end result? 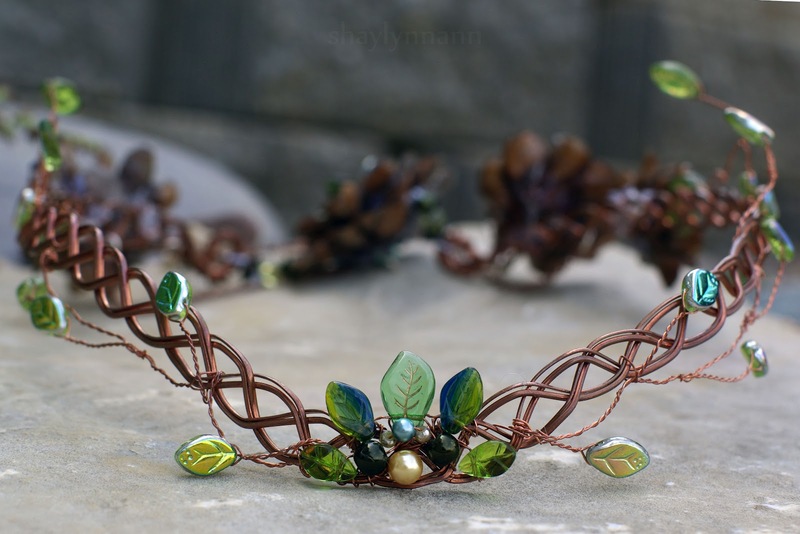 A woodland fairytale wedding headpiece. 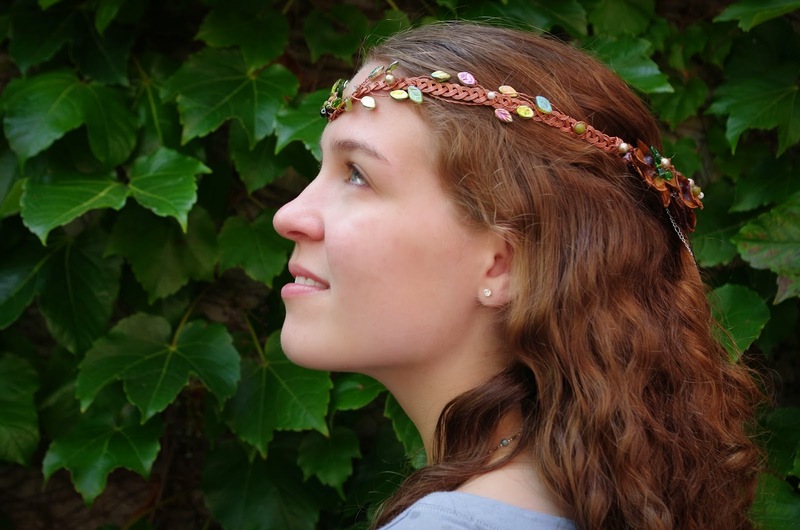 The base of the circlet is braided raw copper, which should develop a beautiful patina over time. I twisted many of my favorite Czech glass leaf beads in various shades of copper onto the copper, accentuating it with some glass pearls. But that is not all, my friends. 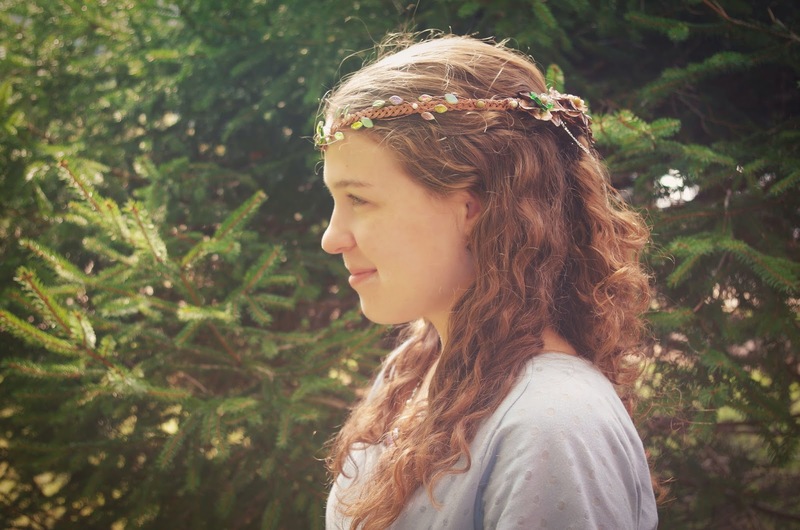 The back of the Entwife circlet is made from real pinecones, more leaves, and strands of sparkling and rustic chains. Two years ago (has it been that long?) 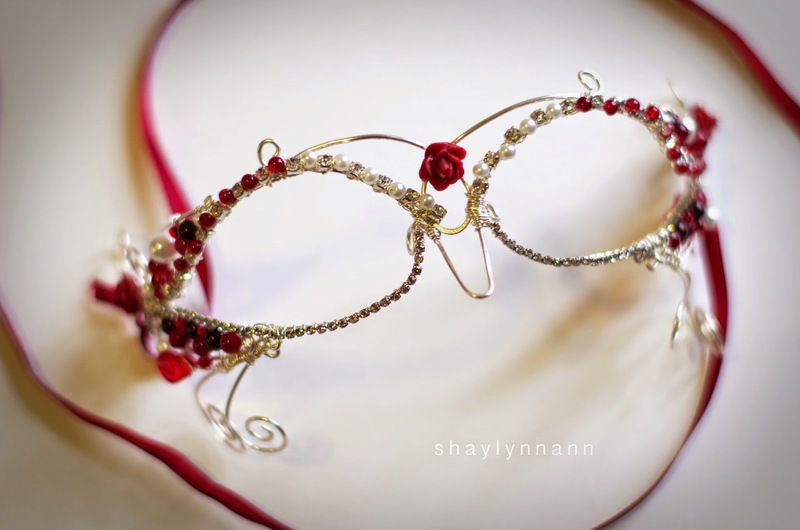 a friend of mine asked me to create an entire jewelry ensemble for her to wear to a Lord of the Rings themed ball. She created an intricate Entwife costume, taught me how to make pinecone flowers, and left me to have fun. You can see all of the tree-folk jewelry here, and a photoshoot with her costume here. 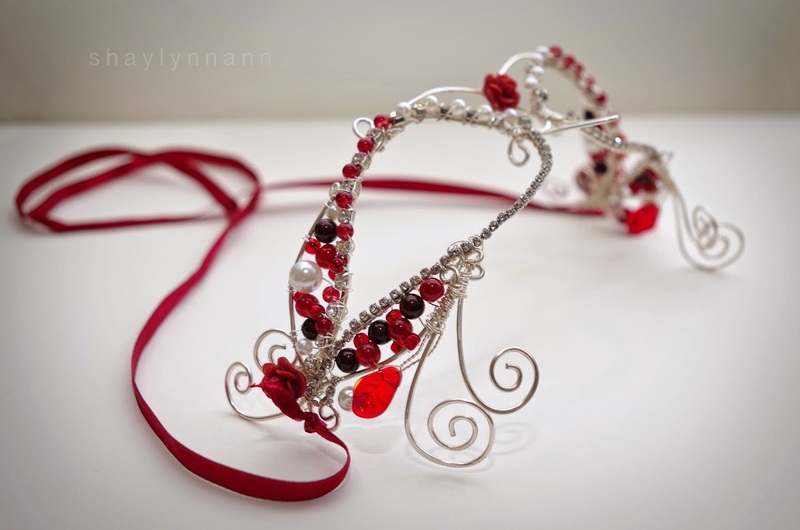 From this entire Entwife collection, the piece that I was the most proud of was the circlet. My fingers were so tired that I didn't want to do any crafting for days afterwards (gasp! --and, also, it's amazing how I've built up some serious finger muscles since), but it was worth it for this large Entish headpiece. 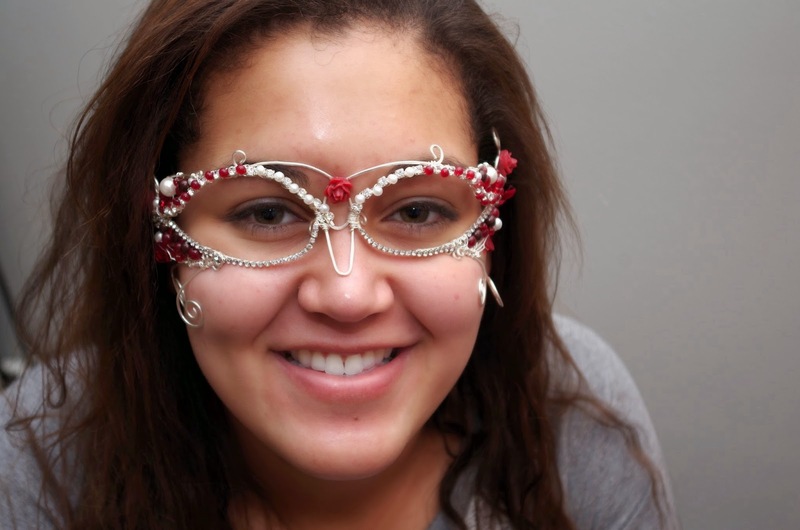 The original version of the Entwife circlet. The copper is already patina-ed. You can imagine how excited I was to get a change to re-create it-- with some changes to reflect my growing attention to construction details, quality supplies, and better techniques. Two years can impart a lot of experience! I would like to officially thank my roommate for being a princess for an afternoon by modeling for me. This entire crown took over 100 feet of copper wire to create! I spent several hours watching Netflix (Dollhouse, anyone?) and drinking tea while I busily slaved away at braiding and twisting wire. Unfortunately I had underestimated just how long it would take to make this piece, but thankfully even with all of my schoolwork I was able to ship it on time. Pinecones do not like me. First, I had to gather them. That is not hard on a college campus; there are several evergreens by the math building, and it was the right time of year for them to be blanketing the ground. The problem? I picked them up between classes, was on the receiving end of several odd stares, and only realized how sticky pinecones can be when I found that my notebook and sketchbook were glued together in my bag. Then, I had to clean the pinecones. I wouldn't let that sticky mess anywhere near someone's hair. Plus, germs. Pinecones have to be baked to let the sap melt off-- that was an ordeal in a dorm. Finally, I had to glue it all together and seal it. That part wasn't too bad at all, but it is when I am doing projects like this that I am eternally grateful for my roommates who deal with my weird projects. In the Lord of the Rings universe, the Ents are the tree people who the Hobbits run into in Fangorn Forest. The Ents are tree-shepherds, and the fate of the garden-loving Entwives is one of the mysteries of Middle Earth. This is WOYWW #287 (and the fifth time I've participated) and if you want to see the workdesks of other artists and crafters, check out the linky here! Well, my friends, this semester has been a doozy. When I wasn't in class for 27 hours (per week), I was working on hours upon hours of homework, working on custom orders for my Shoppe, going to bible study or other meetings, and somewhere in there trying to fit in as much of a social life as I could. Oh, yes, and eating, sleeping, and exercising. Priorities. Needless to say, I don't plan on taking an overload semester again anytime soon. Next semester will only be 15 credit hours. Right now it is finals week, I am delaying on studying for calculus, and I really just want to be home enjoying Christmas break and getting the time and freedom to make some fun art. For today's "What's On Your Workbench," I am going to share some pictures from the past several weeks! 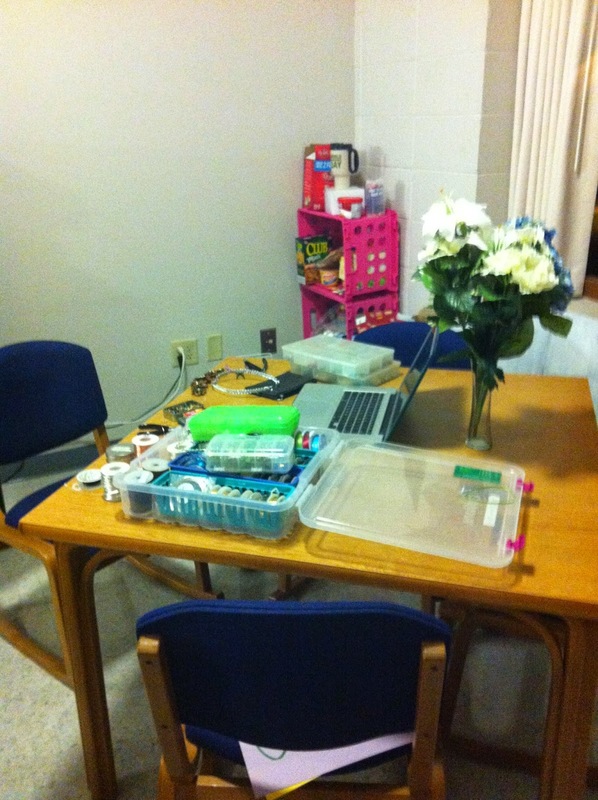 So, this is a slightly random sampling of what my workspaces have looked like this semester. This was when I was watching Anastasia while cutting up the pinecones and gluing them onto copper. And THIS is why my roommate and suitemates are fantastic people. Well-- one of many reasons. They don't kill me when I take over our table with my wire and beads (and pinecones)! This was, again, for my Shoppe. I was stamping quotes on sheet metal, which I then sawed out (yes I was careful with the dorm furniture, mom, I am not five years old! lol!). Our priest at our campus ministry let me work with my chemicals in the church's backyard. I was using Liver of Sulfur to darken the letters and then a resin spray to seal it. 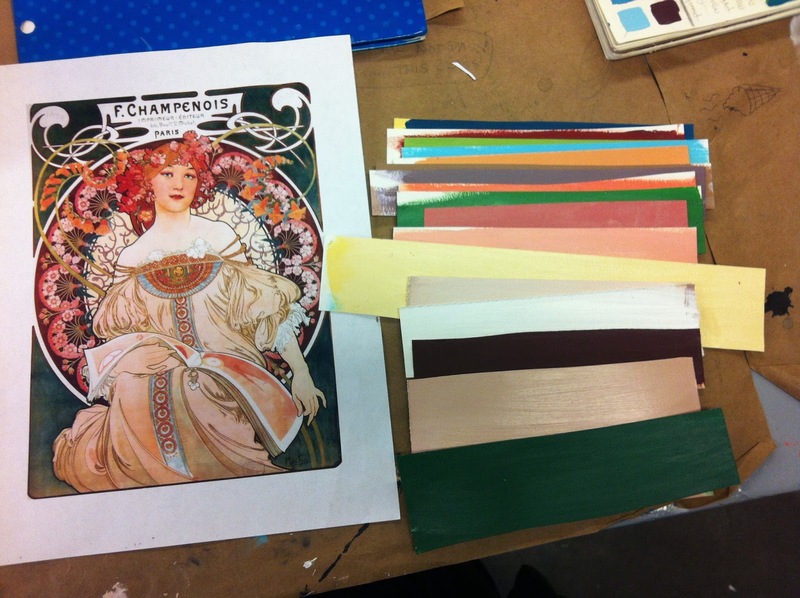 This is a picture from the classroom of my favorite class of the semester: Color Theory. A very sweet, classy, excited Polish lady taught the class. I found good friends among my classmates and am very sad that it is officially over (I had my final on Monday). It's so much fun to be an art student, lugging up a summer's worth of money in paints and supplies up flights of stairs every day. Oh so much fun. But (very nonsarcastically) completely worth it for this class. I'm not sure what project I was working on in this picture below, but I think I was braiding wire for circlets. 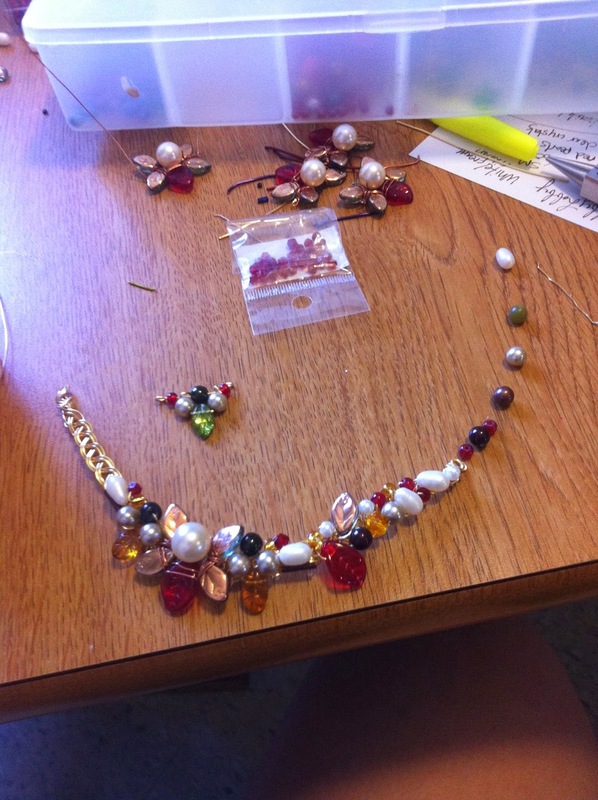 This is the only in-progress shot I can find of the bridal party jewelry I made for an autumn wedding. 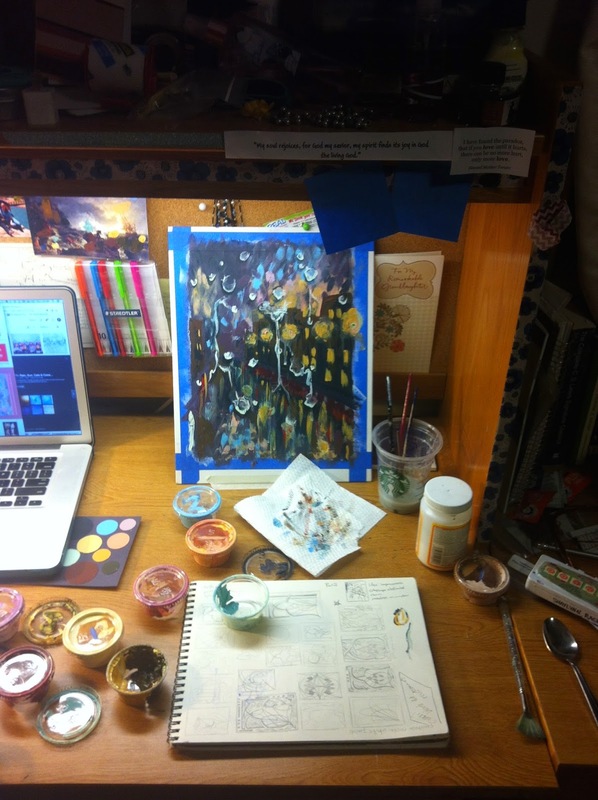 The following three pictures are from my dorm desk when I was working on more projects for Color Theory. 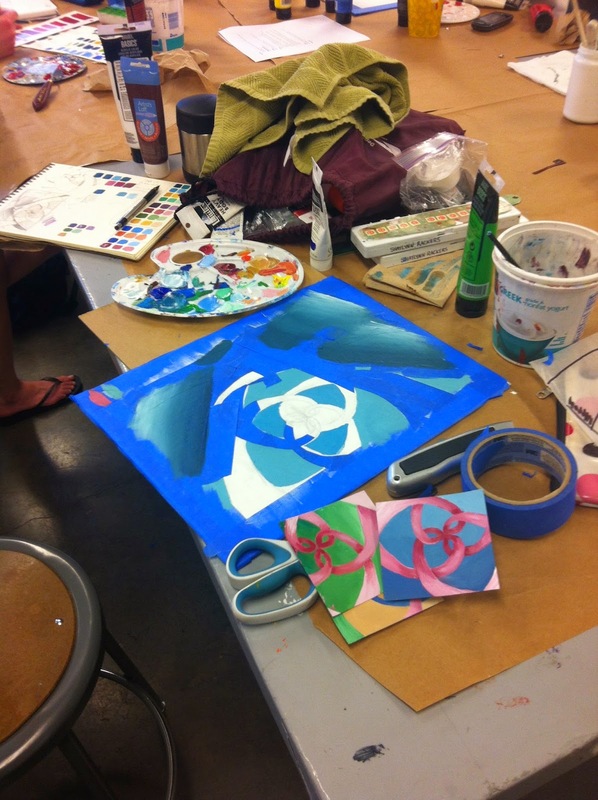 I didn't take many pictures of my design classes-- mostly because I did not enjoy them very much. Don't get me wrong, I love the subject matter and still plan on majoring in Graphic Design-- but it is amazing how much mediocre teachers and projects can try your patience. This project pictured below is, weirdly enough, from a design class! We had to create a piece of art based on a list of mashups our GA gave us. My piece is a mashup of M.C. Escher ("Print Gallery") and Frank Lloyd Wright ("Fallingwater"). We were given the assignment on the Monday before finals week and it was due by our Saturday final. I got so into it that I actually finished three days early. What is this. And what is on my workdesk THIS week? To be fair, I am both packing and studying. I'm off to study for my last three finals, but as soon as I am ready for a study break, I'm going to check out the workspaces of everyone else involved in "What's On Your Workdesk Wednesday"! So should you, if you can. There are some creative people participating in WOYWW. This week is finals week, and to start things off right my campus ministry held a Masquerade formal on Dead Day Eve. 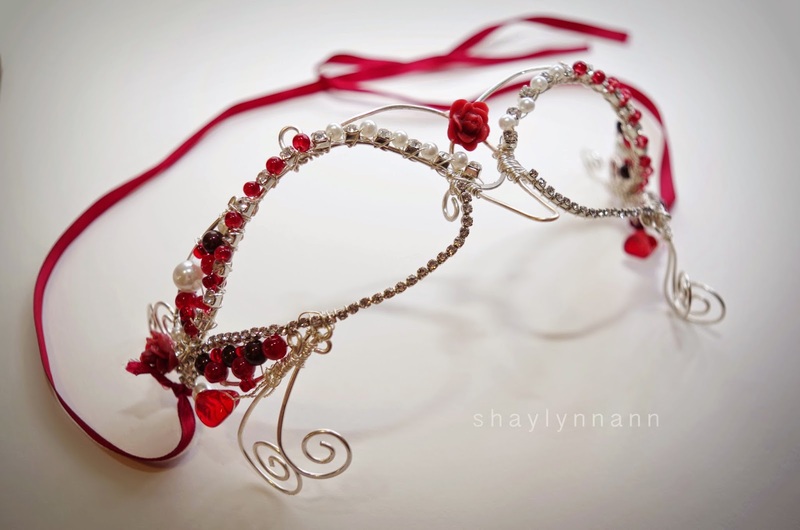 I could have easily worn the mask that I made for my 16th birthday that I was so excited about, but would that do? No, of course not. This is me we are talking about. I had to make something new! Almost a year ago, I scribbled a little note in my sketchbook about "wire masks with swirlies." I can't remember which sketchbook and I very well might just be making that up, but I think it was written somewhere, and I certainly played with the idea in my head for a bit. My problem was that I am very ridiculously busy and I kept prioritizing other jewelry projects, particularly the tried-and-true variants that I know I can sell, because, you know, it's quite nice to have money. Although I had the opportunity to do some experimenting last summer, there still wasn't time for everything! 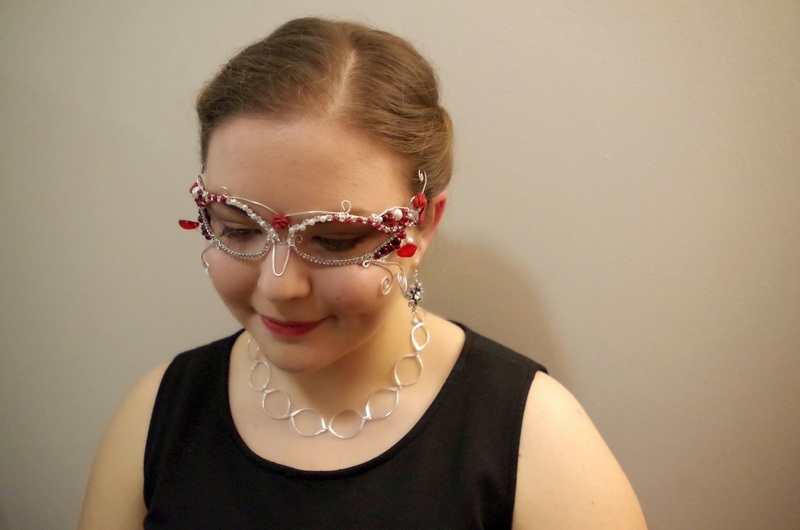 The night before the dance, I sat down at my desk with sterling silver plated wire, rhinestones, three boxes of beads, pliers, a mirror, and some good music. After an hour I joined some of my friends in my dorm, and we all worked on masks (they made some gorgeous painted ones) until after midnight! The finished mask is very sturdy-- I am pleasantly surprised at how it turned out! 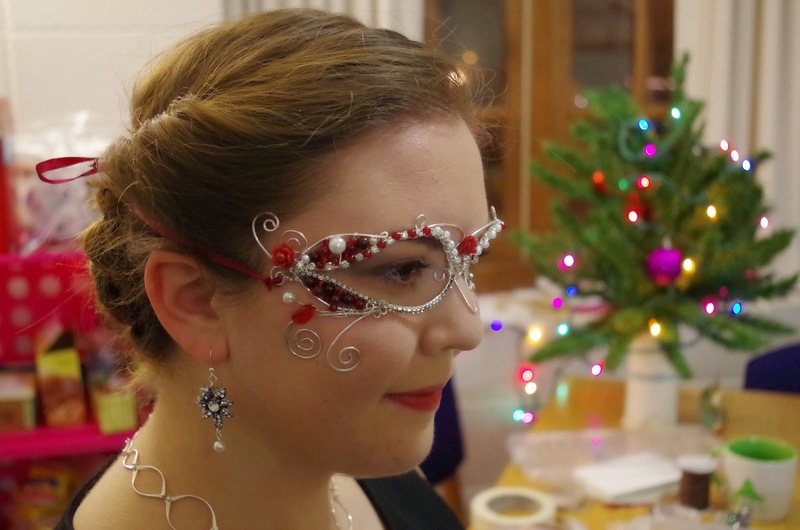 The nose piece-- inspired of course by the traditional nosepiece on Venetian masks-- does an excellent job of keeping the mask in place on the face. 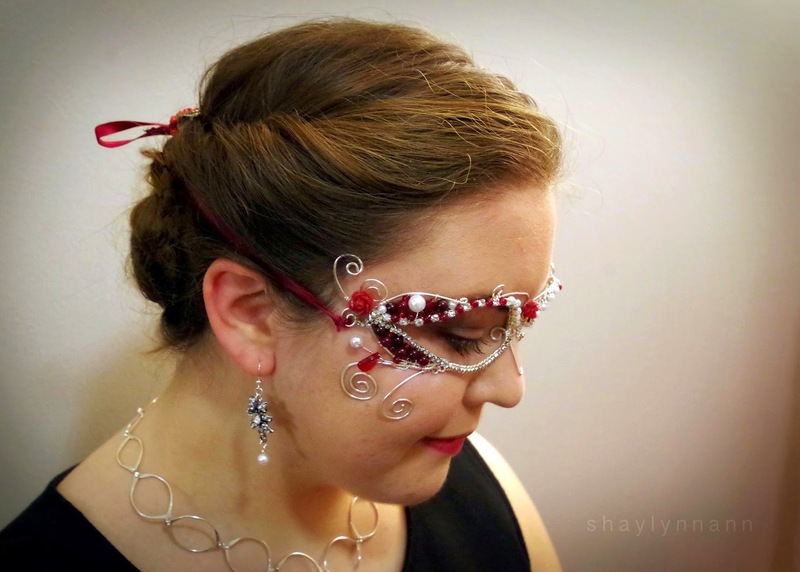 The swirls give an almost fairytale appeal to this mask, and of course the pearls and rhinestones make it glimmer and sparkle! One of the best surprises about this mask is that even after several hours of wearing it, I did not have any dents from metal on my skin, and the swirls NEVER tangled up in my hair! I found that it was quite difficult to mold the mask to fit my face. It must have been quite a picture-- every couple of minutes, after hammering wire in my little dorm room, I held crazy strands of wire up to my face and shaped it just so. I also had to show off my hair... I did it myself and it worked out the first time I tried! For those of you girly girls wondering what a girl who doesn't own a prom dress wears to a college formal... 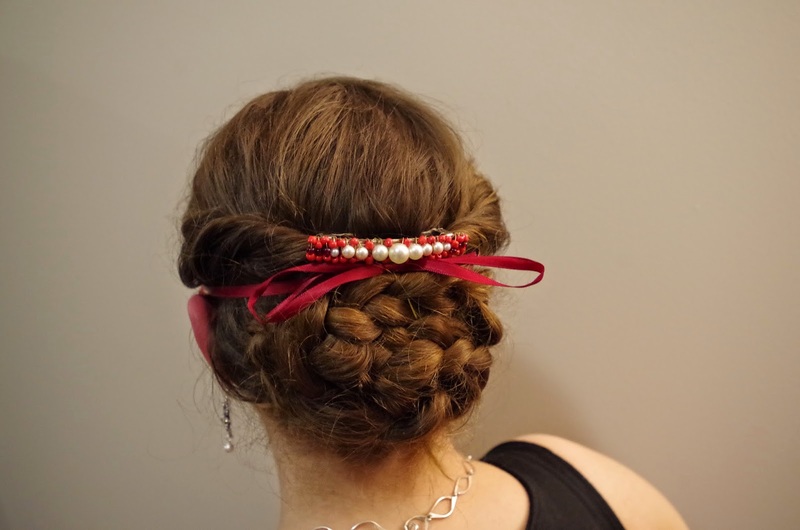 I wore an a-line knee-length little black dress with a slender red belt, a red bracelet and silver ring, black leggings, and black boots (let's face it-- who can actually dance in heels? It is totally not worth it). To top it off I wore a sparkly red scarf as a shawl to drape across my elbows, but that (of course) lasted about five minutes. Since it was cold out I wore my jacket-- a red faux leather that looks very much like Emma Swan's from Once Upon a Time. 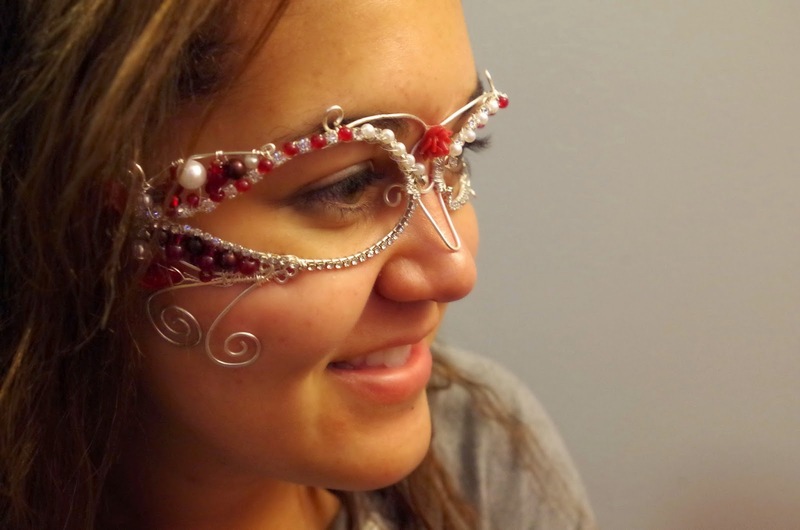 Of course I couldn't resist putting at least a couple of my favorite Czech glass leaf beads on the mask! 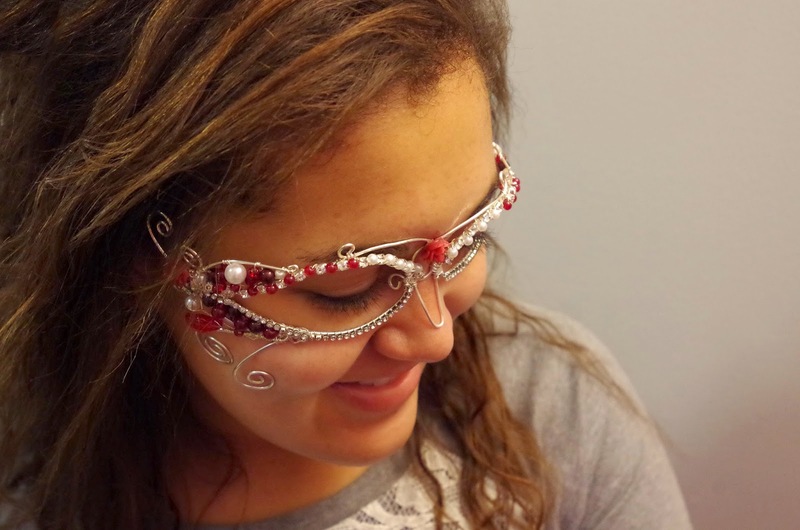 The circlet seems to fit everyone who asked to try it on-- including my lovely suitemate, pictured here. Thanks to my amazing suitemate for helping to model! I only took one in-progress shot. Here it is! At this point I was not very hopeful because the wire kept going everywhere and I may or may not have poked myself in the eye once. I will not be doing that again! I've learned my lesson! The mask has now been cleaned and is available for sale on Etsy at Shealynn's Faerie Shoppe in case anyone is interested. I'd love an opportunity to make other kinds of masks, too! The mask was a big hit, but the best thing was getting to spend hours dancing with my friends! I'm off to the world of studying for finals, so I must bid you adieu, but I hope that you've enjoyed these pictures!